As a chronic fatigue sufferer, life as you once enjoyed it has ceased. Fatigue can be brought on by a myriad of physical, emotional, or spiritual issues. But, whatever the cause, your entire world is now affected by your diminished physical strength. David Powlison understands how debilitating and demoralizing a constant state of fatigue can be through his own five-year struggle after heart surgery. Powlison encourages sufferers that, unlike the world, God embraces the weak and provides strong, enduring resources through Christ for moment-by-moment strength. Readers will learn to adjust their thoughts and expectations and lean into the steady arms of Christ. 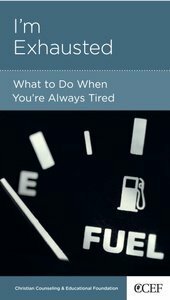 About "I'm Exhausted (Christian Counselling & Educational Foundation Series)"
Customer Reviews For "I'm Exhausted (Christian Counselling & Educational Foundation Series)"
This little booklet gives us a Biblical understanding of fatigue. The author shows us that there are three perspectives to fatigue, the view of the world, the view of God, and the view of the Christian. And that is what makes the booklet so helpful. It helps us see fatigue from other vantage points. Far too often we simply despise fatigue and cannot believe that fatigue could be God's way of working for our good. But Powlison shows us that God often uses fatigue to reveal sinful temptations in our heart, such as anxiety, compulsion, escapism, grumbling, denial and self-pity. If you are constantly exhausted, read this book. It may just get you to see fatigue as a sanctifying blessing, not a curse.